Students sit in UNC Board of Governors seats after their protests disrupted the meeting. They came out to voice support for three university-based policy centers slated for closure. UNC CH Chancellor Carol Folt told the UNC Board of Governor's she disagreed with their voite to close the Poverty Center, located on her campus. Elizabeth Brown, a sophomore at UNC-CH came to the Board of Governor's meeting in Charlotte to protest the closing of three university-based policy centers, including the Poverty Center on her campus. The UNC Board of Governors Friday approved hikes in tuition and fees across the UNC system. But the center of controversy at the board’s meeting was its unanimous decision to close three university-based policy centers, most notably UNC Chapel Hill’s Center for Poverty, Work and Opportunity. The vote came after the meeting was moved to a smaller room because of protestors. The meeting started out quiet enough but when the agenda turned to the closing of the three university-based academic centers, things became unwieldy. 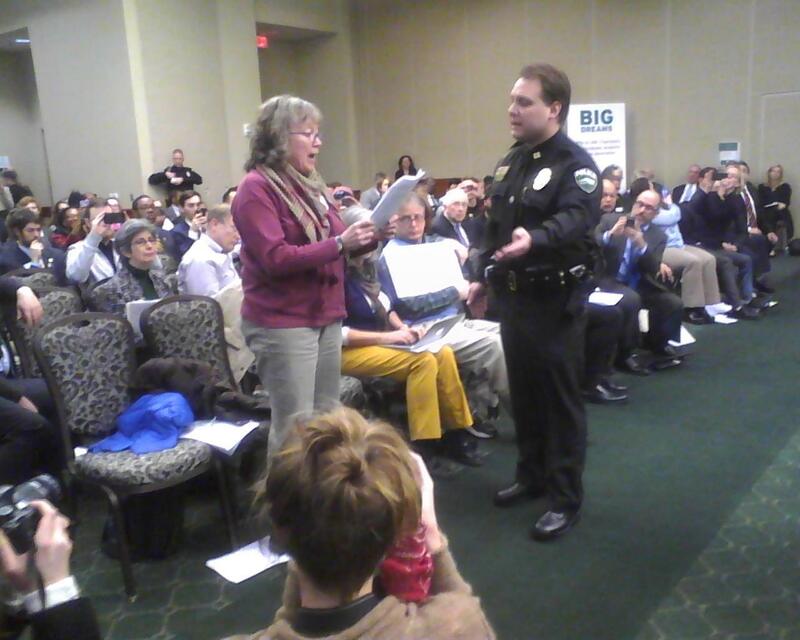 Protesters in the audience stood up, interrupting the discussion. Some were ejected, others took their place, speaking out in support of the three centers. Supporters snapped their fingers in a rhythm and shouted chants, accusing the board of attacking their free speech. During a board meeting, protesters disrupt UNC Board of Governors meeting to protest the closure of university-based policy centers and institutes. The meeting became so chaotic that the board recessed and moved to a smaller room. Only the media was allowed in with board members and other university officials, which angered many. Some tried to go through a door leading to the new location for the meeting but were stopped by security. Eventually, the meeting resumed in a separate area and was streamed to the public in what had been the main meeting room. But about 20 protesters stood outside the doors, their loud chants heard clearly as board members continued discussion on the centers. In the end, the board voted to close the poverty center, East Carolina’s Center for Biodiversity and North Carolina Central’s Institute for Civic Engagement and Social Change. NC Central student Denea Crowell was saddened by the vote. “The Civic Engagement and Social Change Center is a liaison between black youth on their rights as citizens and voting and things like that, so we just need to keep that liaison,” Crowell said. The poverty center remained the main focus for many other protesters, who accused the board of closing it because of its director, Gene Nichol. James Holmes chaired the board’s working group that recommended the closures. He told the board that although the poverty center has been singled out as a scapegoat, politics played no hand in the recommendation that it close. “Our review of that center was no different than any other,” he said. 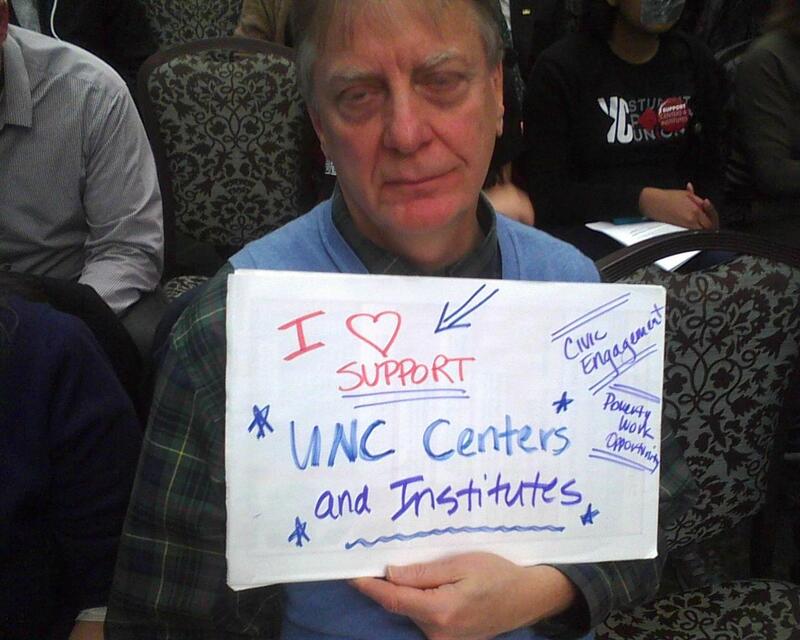 UNCG Professor George Dimock holds sign in support of campus-based policy centers slated for closure. The UNC Board of Governors voted to close three centers. The protesters had the support of UNC Chapel Hill Chancellor Carol Folt. She said efforts are underway to increase the school’s focus on poverty and made it clear that she does not agree with the board’s decision. Emeritus board member Hannah Gage told the board she was concerned about setting a precedent of interference. Those guidelines include reviewing campus centers and institutes on a regular basis to ensure they are in compliance with university policies and training directors on those policies. In other action, the board of Governors also voted to raise student tuition and approved a $30 per student charge to pay for security needs. The 32-member UNC Board of Governors unanimously voted this afternoon to close three university-based policy centers. The action included closure of UNC- Chapel Hill’s Center for Poverty, Work and Opportunity. A UNC Board of Governors committee postponed discussion on a controversial recommendation to close three university-based policy centers. The closures included East Carolina’s Center for Biodiversity, North Carolina Central’s Institute for Civic Engagement and Social Change and the most strongly opposed closure, UNC-Chapel Hill’s Center for Poverty, Work and Opportunity. The University of North Carolina System Board of Governors convenes its monthly meeting Thursday at UNC Charlotte. During the two-day meeting, the board will consider a proposal that would close three academic centers.